Disclaimer: I did not visit Sundarbans. I thought of visiting and studied available options. I met tour operators in Kolkata who organize Sundarban tours. Eventually I decided NOT to take the trip. This post might only helps you in planning your Sundarban visit from Kolkata based on my observations and analysis. When I was planning my Kolkata trip, one of the prospect was to visit Sundarban. Sundarban is a mangrove forest area, some 100kms from Kolkata. When I googled, two main operators emerged- one was by West Bengal tourism, who had different packages with stay in a house boat, prices starting Rs 4300 onwards. But they had once in a week fixed departures which wasn't very convenient to me. Next was a website called Sundarban Chalo. Their website seemed decent and so is the service. I spoke to them on phone- I was told price mentioned on the website is all inclusive. Then sent an email detailing my needs. But I didn't get any reply for the email, so I didn't bother booking anything in advance. Once in Kolkata, I was still in half mind whether to visit Sundarban or not. I've already seen Mangrove forests in Pichavaram, south Tamil Nadu. 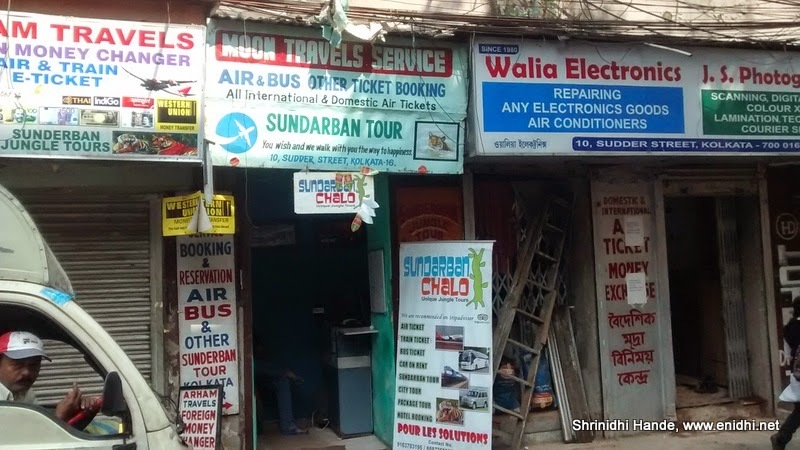 Since Sudder street, where Sundarban Chalo office is located was walkable from our hotel, we walked to Sudder street and found their office. It was a super small office (see pic). We were asked to take a 2 day trip at Rs 4000 per person, instead of one day trip that I was interested in. (Couldn't afford to spend 2 days at Sundarbans). From the itinerary, it sounded like 2 day trip is waste of time. It starts late, half time is lost in city travel itself and same thing that can be seen in a day is split into 2 days with a night stay thrown in. Sudder street is full of tour operators. I asked at 2-3 other operators and got similar quotes, ranging around Rs 10k for 2 people for a day visit. I left my number with the operator, stating that if there're other parties interested, I wish to join at Rs 3000 person rate. Didn't get any call. So I proceeded with Bishnupur visit. Sudarban will have to wait. Also here's another Sundarban tour, 3N/4D which might be of your interest. I hope I get to use this info sometime. I'm dying to see some Mangrove forests. Pichavaram is in my near-future wishlist. Keeping my fingers crossed. Oh, it's a little bit expensive to go Sundarban from Kolkata to Sundarban. As a Bangladeshi, I suggest you come to Sundarban alone if you know the way properly. It would reduce your cost. BTW thanks for sharing.